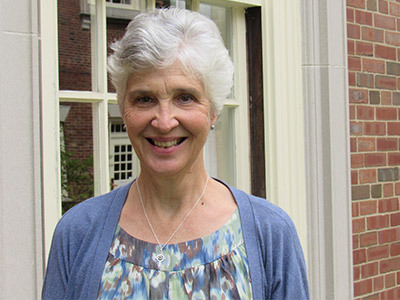 Some years ago now, even before she became the William F. Orr Professor of New Testament, Dr. Edith Humphrey began taking note of her increasing attraction to the rich spirituality of Eastern Orthodox Christianity. After 13 years of discernment, she found herself joining the Eastern Orthodox Church. Several years after joining, she identified a particular way in which she could contribute to the spiritual growth of Orthodox Christians, namely, in encouraging them to understand the integrity of the Scriptures. One cannot fully understand or appreciate the readings from the New Testament without understanding the Old Testament contexts out of which they grow.” So Edith decided to begin writing a blog (and recording a matching podcast) that would fill this gap. Edith explains: “The Orthodox Church’s main Sunday service does not include a reading from the Old Testament outside the Psalms, though various parts of the Old Testament do inform the liturgy. This very ancient tradition omits an Old Testament reading on Sunday for the purpose of concentrating on the ‘eighth day,’ the day of Resurrection. But one cannot fully understand or appreciate the readings from the New Testament without understanding the Old Testament contexts out of which they grow.” So Edith decided to begin writing a blog (and recording a matching podcast) that would fill this gap. “A Lamp for Today,” on www.ancientfaith.com, emerged in 2015. Since then, every other week Edith has posted a blog/podcast that, for a particular Sunday, keys two readings (one from a Gospel, one from an epistle) to the important Old Testament texts that stand in the background. “Sometimes the background texts are quite obvious—for example, when the Book of Hebrews talks about Melchizedek, you know to go to Genesis 14, or when Jesus uses the phrase ‘Son of Man,’ you talk about Daniel 7. But sometimes you really have to think about what would be the best passage from the Old Testament to explain the New Testament text,” Edith notes. Her aim is to take seriously the approach of ancient theologians such as St. Irenaeus, who read the Old Testament as pointing to Christ. “For example, in the Orthodox tradition, Psalm 1 is really about Christ, not just about any faithful person,” she explains. Edith’s blog generates online questions both from Orthodox readers and from Protestants and Catholics interested in Orthodox readings of the New and Old Testament texts. “I always respond, and often our interaction generates an online discussion on the matter—sometimes an extended one, as was the case with a particular reader’s concern about the continued significance of Israel and the Jewish people today,” she notes. Now that the blog is in its third year, Edith has covered most of the major Sunday readings in the Church’s one-year liturgical cycle, so she’s now tackling other Orthodox holy days besides Sunday. “For example, sometimes I’ll do a blog concentrating on how the New Testament readings or hymns for the special feast days are connected with Old Testament readings or events,” she says. And as always, Edith is also pursuing multiple other writing projects—a spinoff from the last chapter of her most recent book, Further Up and Further In (on C. S. Lewis), that, from the approach of theological-anthropology, looks at what it means to be human; an investigation into mediation, its particularity to Christianity, its operation throughout the Scriptures, and its helpfulness for understanding the Trinity; and a long-term book project aimed at recovering for today’s Orthodox Church the meaning and language of righteousness and justice as used by Paul and the Church Fathers. To sign up for Edith’s blog, go to https://blogs.ancientfaith.com/alampfortoday/. The Podcast, running concurrently with each blog post, is found at http://www.ancientfaith.com/podcasts/lampfortoday.